G ood morning fellow health nuts, I’m your host Hercules back again to review my second IONtech ionizer with a hot cup of green tea in hand. 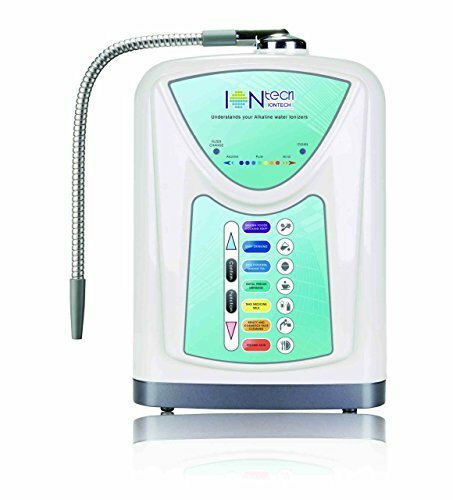 In this article, I share my IONtech IT-580 Alkaline Water Ionizer Machine Review with you. I previously reviewed the IT-757 unit by IONtech. The IT-580 unit is the most affordable machine produced by IONteh, and it is clearly a great choice for savvy bargain hunters who don’t want to fork out $1,000s for an ionizer. I’ve reviewed many machines, and in my opinion, no machine on the market is worth more than $4,000. Many users who have tested the expensive Kangen ionizers have said that their much more affordable machines are just as good, if not better. According to IntelGadgets and IONtech, the IT-580 is their “Basic” unit, but that doesn’t mean it should be passed over by you. 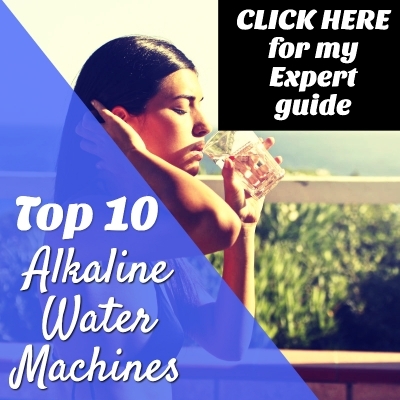 A lot of people prefer to start out with a more affordable unit to test the alkaline waters before setting sail to buy the more expensive ionizers. If one thing is clear, people all over the world are experiencing life-changing benefits. I’ve read hundreds of verified reviews, and some of the stories are incredibly touching. Those stories and my own healing journey are what motivated me to create Alkaline Water Machine Source. Now before I get all mushy on you, let’s jump into the IT-580 review. What are owners saying about the IONtech IT-580 Ionizer? I always like to go over the features first so you know exactly what you’re getting when you buy your first alkaline water machine. By the end of my review, you can decide whether an ionizer will benefit your family’s health the same way it’s benefited countless other families’ well-being. Every premium alkaline water machine I’ve reviewed so far uses platinum-coated titanium electrolysis plates to alkalize the water. Almost all machines come with either 5, 7, or 9 plates. Besides plates, we will look at whether the IT-580 is countertop only, the pH range, water settings, warranty, antioxidant power, and several other options. The IONtech 580 and 757 both come with a 2-year warranty. The Aqua Series by Air Water Life comes with a limited lifetime warranty. However, I wouldn’t be scared away by the 2-year warranty since a quality alkaline water machine will last you a lifetime. The IT-580 sports the least attractive body I’ve seen in all the alkaline water machines I’ve reviewed. There is no LCD screen, and it has a white body instead of the more attractive silver color of the 757 unit. What I do like is that is has a filter change indicator and a cleaning indicator. Even some of the pricier units don’t offer a filter change light. The 580 features 5 premium platinum-coated titanium plates with ceramic membranes to make the magic inside the machine happen. Five plates are typical for this price range. The 580 uses the same high-efficiency ACF-1 activated carbon filter as the 757 unit, but it has a longer life at 1,585 gallons per filter! Unless you have very hard water, each carbon filter should last you a year. The IT-580 makes water in a pH range of 4.5-11. The maximum ORP (Oxidation Reduction Potential) value is -850mV which is surprising to me since the more expensive 757 unit produces the same value. Either way, -850mv is a great value for this price range. Obviously, you will get a ton of antioxidant benefits from water in this range. For anyone who is new to alkaline water machines, the lower the ORP the more antioxidants you get in every glass. Antioxidants are what we want to slow down the aging process. Installation of the 580 looks to be about the same as the 757. Either unit can be installed on the countertop or below the sink with an alkaline faucet adaptor. Below you will find installation videos for both setups. One thing I like about the IONtech ionizers is the extra long hose they use on their machines to make pouring easier, but it’s not too long – just right. The face of the unit is pretty basic, but you can choose all the same water settings as the more expensive 757 unit. There are 4 alkaline water settings, 2 acidic, and 1 for purified drinking water. In case you’re wondering, people typically use the acidic water for cosmetic use or household cleaning. I’ve read many reports written by people who cleared their acne using acidic water alone. The 580 has a built-in thermostat that makes sure the unit doesn’t overheat. All IONtech Ionizers come with a basic pH testing kit. They are the first company I’ve seen who offers a free pH testing kit. The 580’s dimensions are 8″ Length x 5″ Width x 12″ Height. The self-cleaning feature on the 580 is advanced for a unit in this price range. After each use, the unit will automatically clean itself for 10 seconds. Then, after every 30 liters, it will alert you that it needs to do a full 2-minute cleaning. All you do is push the cleaning button, and the 580 makes a sound once it’s finished the 2-minute cleaning. If you’re curious, the machine produces acid water to clean any buildup due to hard water. The IONtech IT-580 weighs 8 pounds, which is lighter than most units I’ve reviewed. Good news for international buyers is the IONtech series of ionizers have the option for 220v connections. A note to international buyers, be sure to contact the seller to let him know that you need a 220v connection. Most IONtech users report an amazingly simple installation process. You can get a feel for the installation by checking out the video below. I read one review by a woman who said that she’s not handy at all, but she had no problem installing the unit. 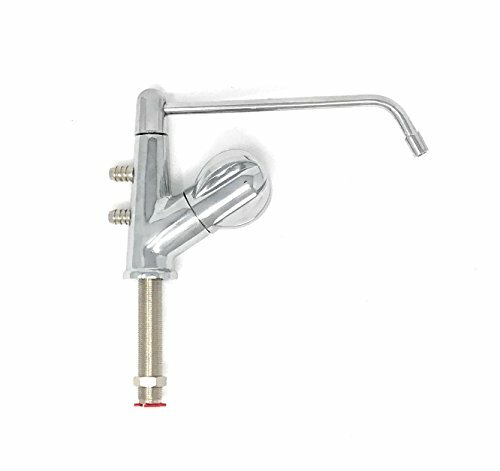 If you plan to install the unit under the sink, click here to check out the chrome-plated faucet tap by IONtech. Also, Amazon offers an affordable expert installation package for anyone who doesn’t want to do the under the sink installation. You want to make sure the job gets done right, you can count on Amazon to send their best. Just choose expert installation near the top of the page at Amazon before adding the faucet to your cart. The experts will install the faucet, test it to make sure it’s running perfectly, and clean up after themselves. Do you plan on installing your unit under the sink? I prefer alkaline water machines that use one activated carbon filter to cut back on filter costs. I also don’t want to have to worry about when a second filter needs to be replaced. With the 580 unit, you only need to think about replacing the filter once a year, and the unit will tell you when it needs its filter changed. 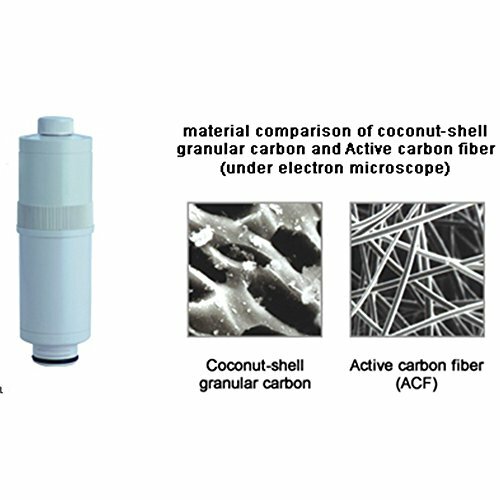 IONtech also uses a higher-grade activated carbon that works much better than the coconut based carbon a lot of companies pass off as high-quality. Each unit comes with one activated carbon filter that is manufactured in the USA. I don’t know about you, but that gets me excited. Each filter lasts up to an amazing 1585 gallons! The replacement filter for the 580 unit is currently selling for just under $70, but you don’t need to worry about that since the unit comes with the first filter. The replacement filter advertises a life of 1,500-3,000 gallons. If you want to prolong the life of the carbon filter inside your ionizer, you can use a 3-stage prefiltration system. However, this is completely optional. The carbon filter will get the job done without the 3-stage system. 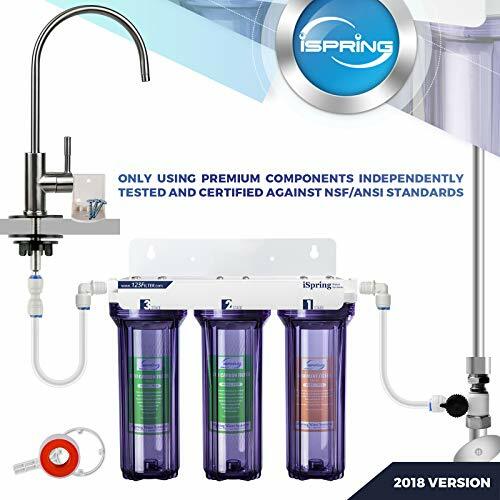 Although, personally, I like the idea of the 3-stage prefiltration because I’m getting perhaps the healthiest water on planet Earth in my home. Nothing satisfies me more than an ice-cold glass of healthy water out of my favorite glass. After years of drinking alkaline water to help me heal from several problems including CFS and chronic heartburn, there’s no turning back. There is currently an affordable 3-stage system with great reviews you can check out by clicking here. For a lot of people, this part of the review is the most important right after the features. Soon I will post comparison tables for all the units I’ve reviewed on the site to make it extra easy for you to compare features, warranties, and prices between all the units. There’s no need to open the machine up to clean it every 1-2 years like some other units. IONtech does recommend running acidic water backward through the machine once every 1-2 years, and they provide clear instructions on how to do it. Owners with well water reported better results by using the 3-stage prefiltration system I mentioned above. Another person asked if the unit is BPA and Lead-free. The manufacturer confirmed that the unit is food grade materials only and BPA and Lead-free. Customer service is quick to respond and polite when helping people with their installations or other questions. For people who want to take an ionizer on the road with them, this lighter unit is possible to travel with. A man and his wife said they travel a lot, and there’s no problem bringing the 580 on the road. The manufacturer recommended carrying the carbon filter in a separate plastic bag while traveling. One man called the plastic “sturdy,” and he saved over $500 by choosing this unit over a more expensive option. He bought the unit after doctors recommended it to help his wife who had breast cancer. They’ve reported positive results. Last but not least, let’s see if all the alkaline water benefits people are talking about are true. Are users of the 580 experiencing health benefits and what are they? One woman reported that her husband who has colon cancer is feeling better with chemotherapy after drinking alkaline water for just two weeks. She sounds optimistic, and I wish her and her husband the best. I found yet another report of a pet refusing to drink tap water after being given alkaline water. A man reported that his dog refuses to drink tap water and will only drink alkaline. This is very interesting to me because dogs and cats have great instincts. If you don’t need some of the features on the more expensive units like the LCD display and want to save $1,000s, the 580 is a solid choice for you. I think the 580 is a great starter unit. You can always upgrade later once you and your family decide if the health benefits are worth the cost. If you plan to install the unit under the sink, the less attractive body of the unit shouldn’t be a problem. The 5-star verified reviews written by happy customers are what sold me. People are getting exactly what they want which is quality alkaline water. Why pay a crazy high price to get the exact same end product? The man who said he’s been using his machine for four straight years without any problems was all the evidence I needed to recommend this product to you.